"I've spent an age electronically cleaning this old slide up. 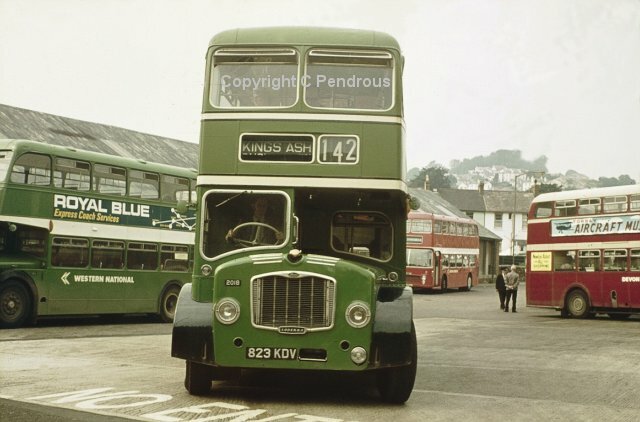 Anyway, this was Paignton Bus Station, Devon on 25 August 1973. There's just a little bit of everything in this picture for the true Western National enthusiast. However, it's late, and I'm too tired to comment further, so I'll leave it to you guys" Claire Pendrous. The very thought of running a double decker on a journey as short as the one to Kings Ash would have a modern day scheduler apoplectic! Evidence of the NBC absorption of Devon General 2 years previously are manifold; the Royal Blue ad' on the Bristol LD, the block-lettered fleet name on the Regent V and of course the very existence of a poppy-red VRT. This Series II would be one of either the BFJ-L or ATA-L batches and retains its pointless rear wheel discs. A Duke of Edinburgh stand-alike takes his chances with anything reversing off a stand. The Gardner engine FLF was new to WN in May 1963 and did a good 17 year stint before retirement. Although this bus does not survive, fortunately sister 824KDV does. Its my birthday coming up on Monday so I feel like indulging myself, so as Claire has titled this picture as ‘Go On, Indulge yourself’ I felt I had no choice other than to feature this superb shot of Western National 2018 at Paignton Bus Station.